By Reehan M. Ali, D.O., and Daniel J. Cranford, D.O. What are the common causes and serious complications of this condition? 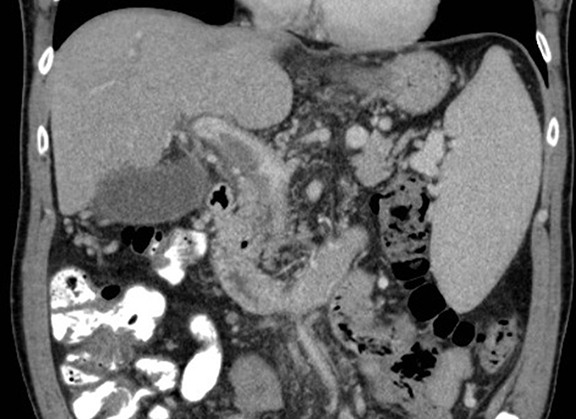 This single coronal reformatted CT image with oral and intravenous contrast demonstrates a filling defect in the main portal vein, consistent with portal venous thrombosis (PVT). Patients with PVT most often present with nonspecific abdominal pain; fever, hematemesis, and weight loss are less common clinical presentations. PVT may also be an incidental finding, especially in cases of chronic thrombosis. Typical causes of PVT include hypercoagulable states, cirrhosis, inflammatory conditions such as pancreatitis, and invasion or compression by tumor. On unenhanced CT, thrombus typically appears hyperdense. On contrast-enhanced studies, bland thrombus presents as a hypodense filling defect, while tumor thrombus may demonstrate enhancement. Non-visualization of the portal vein is also suggestive of the diagnosis. In chronic cases, collateral veins develop in the porta hepatis, which is referred to as cavernous transformation. On US, PVT has a variable appearance. Color Doppler images are instrumental in confirming suspected thrombus seen on gray scale images by demonstrating absence of flow within the involved segment (some flow may be seen within tumor thrombus). Color Doppler may also demonstrate reversal of flow within the portal vein in the opposite direction of the hepatic artery, termed hepatofugal flow. PVT leads to portal hypertension and associated sequelae, to include varices, splenomegaly, and ascites, which may be difficult to manage. More concerning complications include rupture of esophageal varices, hepatic infarction, and in some instances, bowel infarction from mesenteric thrombosis. Ali RM, Cranford DJ. At the Viewbox: Portal Vein Thrombosis. J Am Osteopath Coll Radiol. 2012;1(4):43. Reehan M. Ali, D.O., and Daniel J. Cranford, D.O. Dr. Ali and Dr. Cranford work with the Department of Diagnostic Radiology, Botsford Hospital, Farmington Hills, MI.